Devised to rescue failing IT implementations, the Incremental Software Architecture book presents an advanced approach for designing durable, flawless, and elastic enterprise software systems to enable business growth. “In their current incarnation, IT and business organizations are not nimble enough to meet customers’ demands, and there is no defense against software development life cycle shortcuts that result in the deployment of failing systems to production,” stated author Michael Bell. “We are facing a chief change in the way we architect and develop enterprise systems. Such a shift in organizational thinking would eliminate the difficulties of trying to conserve a centralized management structure that is slow to respond to critical business events. A lightweight Micro-Organization would then become proactive, reducing the staggering cost of enterprise policing and governance. Enterprise-wide technology standardization, therefore, would be the practice of the past, and enterprise-wide architecture best practices and standards would cease to exist,” Bell added. 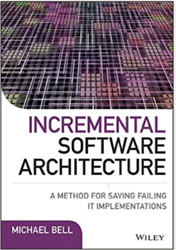 Incremental Software Architecture is available now in book stores and online around the world.